Our answer is almsot always… it depends. There are a number of exploratory and discovery questions that need to be asked in order to properly determine if your company or organization would be better served with a hosted/cloud system or an on-premises system. Some of our questions include: How does your company currently use telecommunication technology? What are your company’s goals for adopting new technology? How do you see your company evolving in the future? Does your company operate remote offices, and if so, how many remote locations do you have, and how many employees/users are in each location? If your company has multiple locations but has only a few employees/users at each site, then a hosted/cloud system could be a great fit. However, if there are several locations with many employees/users at each site, an on-premises system may be the best option. It is a simple calculation of return on investment over a 3-, 5-, or 10-year period. As an example, a company with multiple locations and many employees/users at each site will spend 30% – 40% less over a 5-year period with an on-premises system rather than a hosted/cloud system. One important element to note is that an on-premises system is a one-time purchase, whereas a hosted system is a monthly payment for as long as you engage the service. 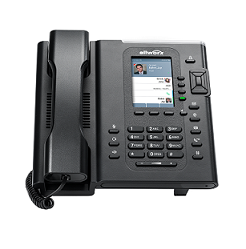 Another key question: Does your company favor funding a new phone system using capital expenditure (CAPEX) or paying for this type of service through operational costs (OPEX)? Though CAPEX spending has been predominantly used in the past, the new hosted technologies are designed as a “pay as you go” OPEX service. This is typically much less burdensome than financing the purchase and implementation of a large on-premises system. Other pertinent questions relate to the implementation process, such as: How do you foresee your company’s IT Department handling the implementation of either a hosted/cloud or on-premises system? What is the IT Department’s availability as well as depth and breadth of knowledge to manage the implementation? How familiar/comfortable is the IT Department with this technology and its benefits? Will the IT Department be on board with the fiscal reasoning for choosing one technology over the other? One question leads to another when determining the best fit for your company. It is important to recognize that these are not casual conversations. The experience of responding to exploratory and discovery questions plays a significant role in determining which type of system best serves your company’s needs. Whichever is chosen, it should transform your operational efficiencies; that is our goal for your company.